Contactless payments are becoming increasingly popular in Canada, with larger stores adopting the new system at a rapid clip, and smaller merchants expected to jump on the bandwagon, a recent study reveals. By 2014, a significant chunk of transactions in Canadian stores will be carried out using these payment systems, according to the study by Technology Strategies International, an Oakville, Ont.-based tech market research firm. “In that year, we expect the value of contactless transactions to reach $5.6 billion,” Christie Christelis, president of Technology Strategies told ITBusiness.ca. Contactless payment systems — also dubbed “touch and go” or “wave and pay” – involve use of RFID-enabled credit or debit cards to make secure payments. MasterCard PayPass is an example of an EMV compatible, “contactless” payment card. In 2005, MasterCard commenced roll out of PayPass in certain markets and by the fall of 2008, a range of Canadian financial institutions were issuing PayPass, including Bank of Montreal, PC Choice Financial, Canadian Tire Bank, and CapitalOne. When a “contactless payment” transaction is done at a retail store, typically consumers wave their card at the point of sale, and an embedded chip transmits transaction data to a reader located there. Some suppliers claim such transactions are almost twice as fast as conventional cash, credit, or debit card purchases. MasterCard Canada says it has seen “about 25 per cent” higher spending by users of its PayPass-brand RFID credit cards. Whatever the drivers are — whether ease of use, speed, or convenience – there’s every indication the technology is taking off big time in Canada. The installed base of contactless terminals will grow at a rate of 44 per cent, per year (CAGR), over the next five years. 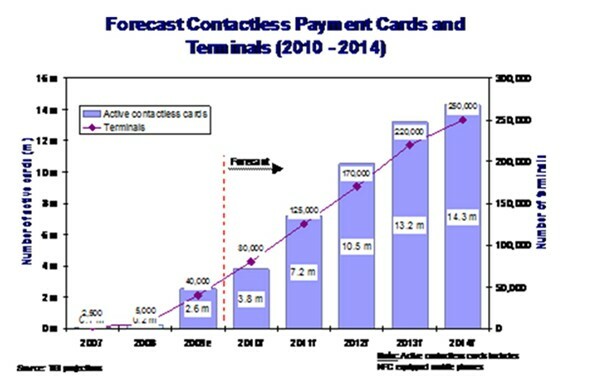 By 2014, there will be around 14.3 million active contactless cards in circulation, including those installed in near field communications (NFC)- equipped phones. However, the adoption dynamic here is a bit counter-intuitive, Christelis noted. The same “top-down adoption trend” may be witnessed in the U.S. as well, suggested Shyam Krishnan, an industry analyst and team leader with Frost & Sullivan’s information and communications technology group. “Larger vendors are more capable in terms of cash allocation, to adopt this technology,” Krishnan said in an e-mail response to ITBusiness.ca. However, he said, tier 2 vendors would get with the program over time. The rapid growth of “contactless payment” technology and systems is a direct consequence of larger stores rolling out this technology, said Christelis. And he said while big retailers may be early adopters, it won’t be long before small and mid-sized outfits follow suit, as they too realize that offering customers quicker and easier payment options is great for business. RFID-enabled credit and debit cards aren’t the only mechanism available to consumers for contactless payment transactions. Mobile phones can be used for the very same purpose. It’s possible to put a chipset in the mobile phone that could interact with the “contactless reader” at the point of sale. In the next generation of smart phones, such chipsets would be a standard component and would be directly integrated with the phone’s electronics, Christelis said. But he said it would be at least five years before we see phase two kick in. But he also listed challenges to the this technology, including the need for: consistent standards to ensure interoperability between various systems, co-operation between major participants in the eco-system (fee and costs splits) and merchant adoption for smaller value transactions. “These challenges have not been overcome fully yet,” Krishnan told ITBusiness.ca. He said the 2008 and 2009 recession led many vendors to delay NFC adoption. “Dialogue between vendors and other stakeholders in the eco-system, such as network operators, needs to resume and translate into real pilots and roll outs,” the analyst said. In Canada, it’s not just in retail stores that contactless mobile transactions will take off. “We’ll witness the same phenomenon in banks that are already experimenting in a big way with mobile,” said Christelis. Acknowledging there are security misgivings about contactless payment and mobile (NFC) payment technologies, Christelis said these are mostly unfounded, in Canada at least. In 2008, RIM filed a patent for an application designed to allay security concerns relating to NFC payments. The “pinch to pay” app, which was published in April this year, seeks to ensure that contactless payments cannot be made from a NFC-enabled smart phone without the owner being aware of it. It also ensures that the NFC feature uses as little power as possible when not in use. Meanwhile, the depressed economy has had quite a bit of impact on how Canadians choose to pay for goods and services. The Technology Strategies report predicts non-credit card payments will account for one third of all online payments made by Canadians by 2014. It says while cash will remain the most frequently used form of payment in Canada over the next five years, it will suffer some erosion from contactless debit and credit payments.